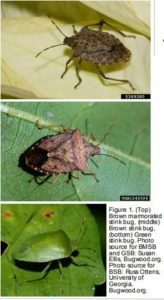 This past growing season, damage caused by stink bugs proved to be one of the biggest surprises to many growers. The reality is, there are several species of stink bugs that feed on corn and soybeans in the Ohio and Indiana regions (Fig 1). Stink bugs will overwinter in any type of ground cover or residue on the ground that will provide a protective cover wintering habitat for them. They feed by penetrating the plant with a piercing mouth piece and extract nutrients from the plant. This entry point provides a way for disease to enter into the plant. When they feed, stink bugs inject digestive enzymes that can cause deformation of plant tissue or abortion of seed. Stink bugs can feed on foliage, stems, pods, or ears of the plant. 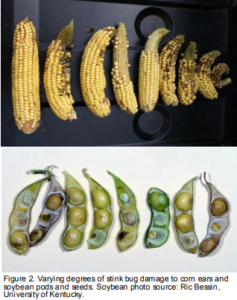 In corn, stink bugs can feed at various stages from early vegetative stage to the time of kernel formation. In soybeans, a lot of feeding is done after the pods are starting to set. Stink bug feeding not only causes yield loss but can affect the overall grain quality (Fig 2). To control stink bugs, scout your fields on a regular basis and spray when they reach threshold of one stink bug per foot of row. In soybeans the critical period for control is R3-R5, to prevent feeding on pods and seed. Stinks bugs can have one to three generations per year so scouting throughout the growing season is important.